You are here: Home / DID Education / Can the Horrors of Halloween Drain Away, Leaving Room for Fun? 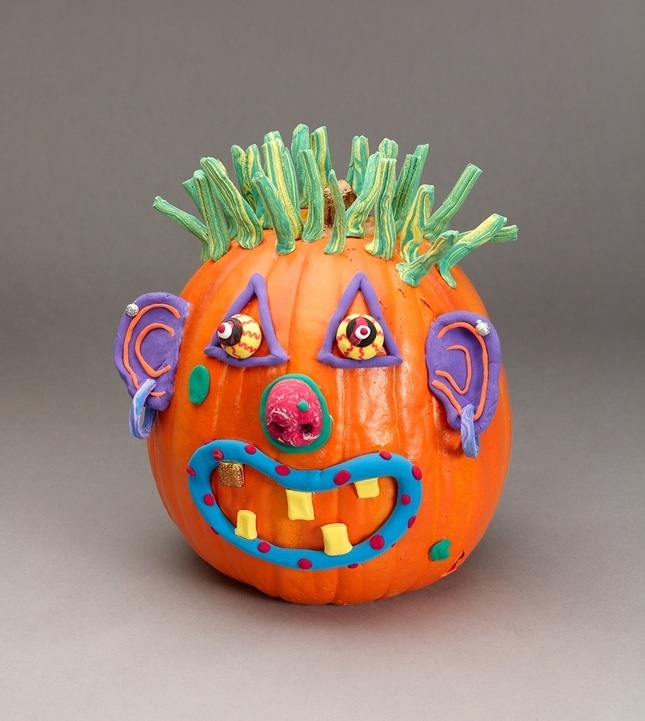 For most dissociative trauma survivors, Halloween is a difficult time. Halloween is an expansion filled with horrific memories, vivid flashbacks, overwhelming darkness, and uncomforted fear. Internal systems flip and change, with those typically lodged in the back finding their way to the front, making the usual everyday feel completely different from before. Working with these dark parts is essential for healing. They may frighten you, but they need your patience, understanding, and compassion for having survived the horrors they had no choice but to endure. Living through the Halloween season with active PTSD and heavy traumatic overtones may be as delicate and sensitive as fighting for one deep breath after another. For survivors with Dissociative Identity Disorder, and survivors of Ritual Abuse, the pain is real, and the struggles last year after year. Resolving system conflicts and sorting through trauma memories is hard work, and yet needs to be done for internal peace. It’s important to listen to your inside parts and comfort them after the horrors they’ve seen. All forms of memory processing — talking about it, drawing pictures, writing out feelings, creative expressions, EMDR, renovating the inside world — are important. What else can you do to make this time easier to manage? It’s very difficult to change a traumatic time into something liveable, let alone enjoyable. One element of healing is purposefully making new positive memories that can be connected to painful days. Resolving the trauma gives you room to create something of your own — room to make memories that you can enjoy and moments in life that bring a smile to your insides. I am not saying to deny your Halloween trauma. Not at all. The healing work and system work is essential. Keep at it – it’s important, no matter how difficult it is. I am suggesting that adding an element of fun can help your traumatized insiders move forward from the traumatic places where they are stuck. Making your inside worlds and outside worlds more liveable is important. It is essential to create new rules, — your very own rules — not carried onward from the past, but your very own personal rules created now, in the present. Part of your new rules could be that fun can be allowed now. 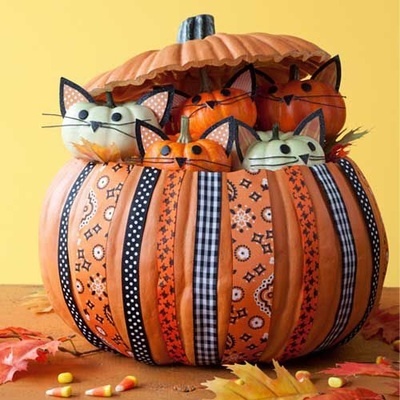 Most of you have probably been seeing the avalanche of Halloween decorations everywhere. Many of these are scary, upsetting, and triggering. It’s hard to avoid and the gruesome masks and gory pokes at “scary fun” are not so funny. What can you do as something new? Find something about the Halloween season that you and your insiders can play with and turn a yucky thing into a Corrective Emotional Experience. That’s where you get to do something new and different, so it has a positive outcome THIS time, instead of the negative outcome you might be used to. Pumpkins are everywhere at this time of year. Pumpkins are a common symbol of Halloween and the autumn season but pumpkins haven’t necessary been used as frequently in ritual traumas. I’m sure this isn’t the case for everyone, and the idea of making a pumpkin fun might not be a workable option for all of you. 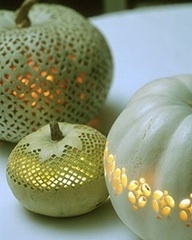 Hopefully you can take this idea, and instead of using pumpkins, use a different theme. 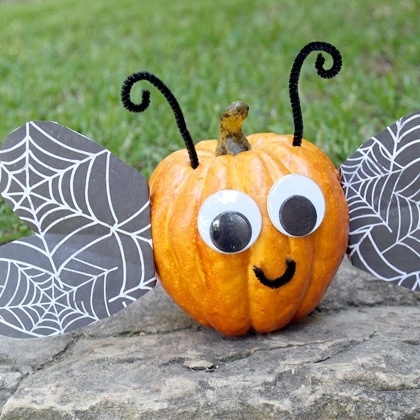 I’ve done a little searching for pumpkin crafts. 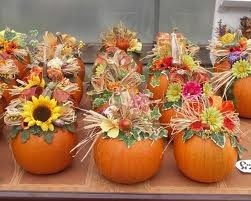 Have a look at some of the pumpkins I’ve found. Look for something that can be fun for your child parts. The goal is to let them enjoy more in life. We aren’t likely ever able to remove Halloween from happening out there in the world, so attach something you can enjoy to the tie period. Do you enjoy making something pretty to look at? Do you want a grown-up design that adds elegance and beauty to your day? What about making pumpkin bread or pumpkin muffins? Do you want something funny that makes your internal kids smile and giggle? Do you like polka dots? Do you have a cat or kitten or puppy? 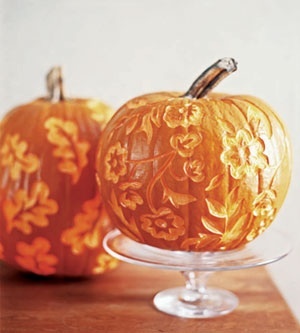 How about remembering your loved ones in a fun way, and draw their faces on your pumpkins or squashes or any fruit? How about taking a different “fun thing” and overlaying onto a more sensitive object? What about making faces that represent your insiders? How many people in your system would be willing to front up in this idea? I hope these ideas give you something to consider. 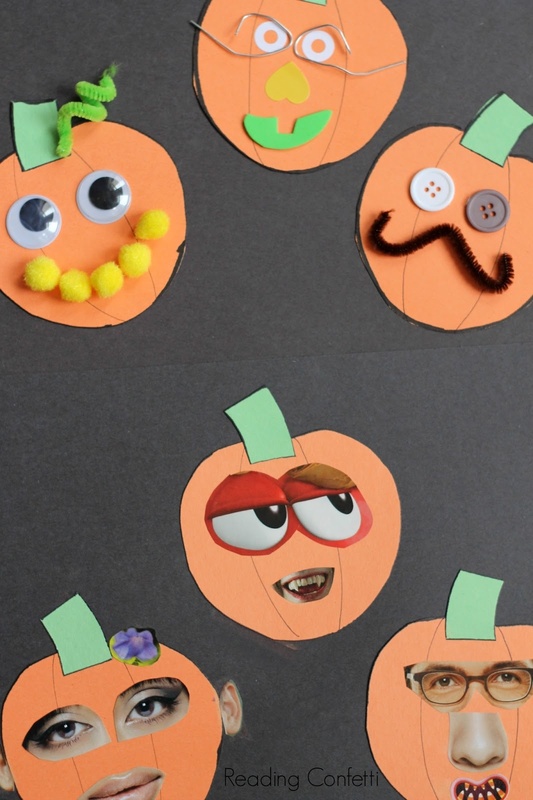 Try making Halloween something less scary this year by focusing on new, creative experiences. Give your kids something to enjoy, instead of a fright, or a trauma. As you build more positive memories, and as you work hard to change the current day to something positive instead of negative, you can to help everyone in your system to feel safe. Your system people will need to learn what safe feels like — this will be a new experience for them. They are far too used to fear and trauma. A huge part of your healing process is letting them have positive experiences, over and over again. They need repeated new experiences and learning opportunities to become familiar with fun and safety. Creating these Corrective Emotional Experiences not only gives your insiders positive new memories to enjoy, they also create a further distance in time between when it was bad, to now it can be okay. The further removed your insiders feel from danger, the safer they will feel. So how about it? Are you gonna break the cycle of repeated abuse memories with something fun, creative, entertaining, and delightful? 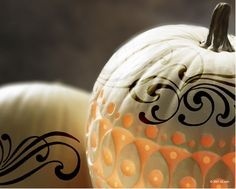 I wish you the best in your healing journey, especially with a fun pumpkin. Thinking of dissociative trauma survivors during the difficult Easter weekend. I find this strange and can’t understand why Halloween would be a source a stress for such people… it certainly has no negative effect on me whatsoever, I love Halloween. I will say this–beware of haunted houses. Went into one with a friend and a character came popping out and banged on the wall directly next to me. I thought he was going to hurt me. Ended up having a few moments of numbness and whatnot. Snapped out of it pretty quick. It wasn’t immediately apparent this would be a trigger…I didn’t think my response would generalize to people in costume like monsters. I’d think twice about haunted houses. If you do go, ask questions about the experience ahead of time (“Do any of the actors touch you?” Any loud noises?”), especially if you know what your triggers are. Theres no way to make holoween fun!!!! Thers all the bad pepl that lovs it they do all sorts of bad things it be ther happy day we cant tell anebudy and ther no way to make ane part of it into fun kathey! 🙁 no! You dont get it ther dont be a way to majic holowen into a betr day. You cant fix it just by puting happy fases on punkins NO no NONO!!!!! It dont work like that!!! Is that really so, that “the goal is to let them enjoy more in life”? It seems appealing, but it has always felt like we should push them down and get on with business. I don’t like it at all when people decorate with graveyard scenes, but i guess they have never lost someone close to them. Mala, you are lucky then that you have not experienced first hand the cruelty some people will inflict on others in the name of fun or ritual or other unspeakable things. (((((Pilgrim)))))) safe hugs if you would like them!!! We care about you!!! 1esmecat, my first experience (aka wrong therapist) with EMDR was just as you describe. I wouldn’t go near it for years, either. First, you have to have an actual trauma therapist. Second, they have to have excellent training in EMDR and recognize if retraumatization is happening. 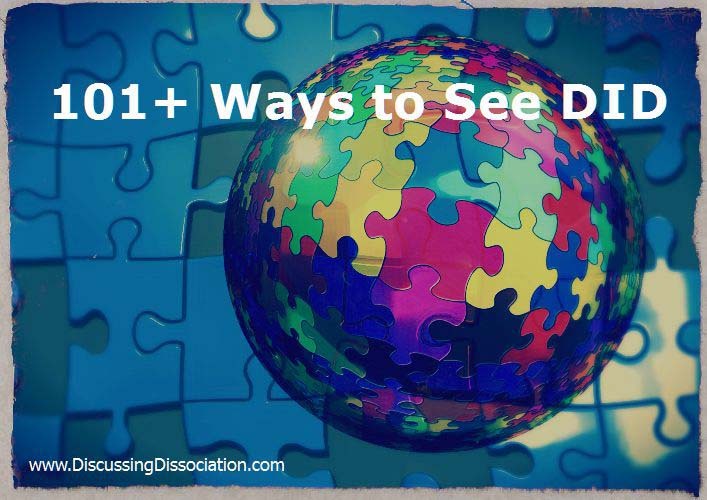 Third, if they don’t understand DII, they won’t know who is responding in what way to the EMDR. My T rarely uses it with me and is very careful to watch for clues. Maybe one day you will find the right person for it. And if not, that’s ok too. My T had me tell exactly what happened when it was first used on me and urged me to teach others how NOT to use it. Michelle, great tip on haunted houses!!! I remember 2 horrible times myself at 2nd and 3rd grade school event haunted houses that have left their scars. I don’t think I’ve gone to one since! Take care all, be safe, keep your cats indoors, and do something good for yourselves!!! Maybe next year. I appreciate the post though. If only I had a white pumpkin . . .
For us halloween is horrific. Kathy writes a very good article for anyone who can do those sort of things. We simply cant. Hello, Kiyacat, i appreciate what you had to share. I’m grateful you are willing to talk about it. I understand what you are saying about everything that needs to be in place for good therapy, but i have been very concerned about the lack of warning to the general public/ patient population re: the fallout that can come with emdr. You really do have to live through it to know just how bad it can be. I searched for a long time to find the answers, because there’s just so little out there about adverse effects and their causes. “Lancing” is such a contained, sterile-sounding word; to me it is laughable to think that some professional felt it adequately conveys the horrendous inner avalanche a patient experiences. Anyway, i live too far from any trauma or dissociative disorder specialists, although there are plenty of professionals who say they work with it. I do think i have made some gains in therapy otherwise, but, right, i’m not at all inclined to try emdr again. I find it very interesting that your therapist rarely uses it with you anyway. But i’m guessing you would feel you’ve made good progress by the way you write, and i’m really glad you have a good therapist now. I know there are a lot of people who are pro-emdr and say they’ve had wonderful results, but not this girl. Thanks, Kiyacat. And thanks, Kathy, for allowing me to share my thoughts, even though they may seem negative. I really don’t mean to be negative, just really concerned. to those people who are posting about not understanding halloween – it is a major date in satanic ritual abuse calendars, as with anniversaries you can expect a lot of flashbacks, switching, etc. It has another name which I won’t post here but very bad things happen in many abusive groups at that time. There is also the connection between masks & costumes used to hide the identity of abusers (i.e. pedophiles) not to mention the horror films of TV all day and the horrid costumes and dark nights. and i didn’t mean to minimize their suffering by the tangent my thoughts followed. I think halloween is getting played up more and more as time goes by, and that just makes it worse. I love love love this post. 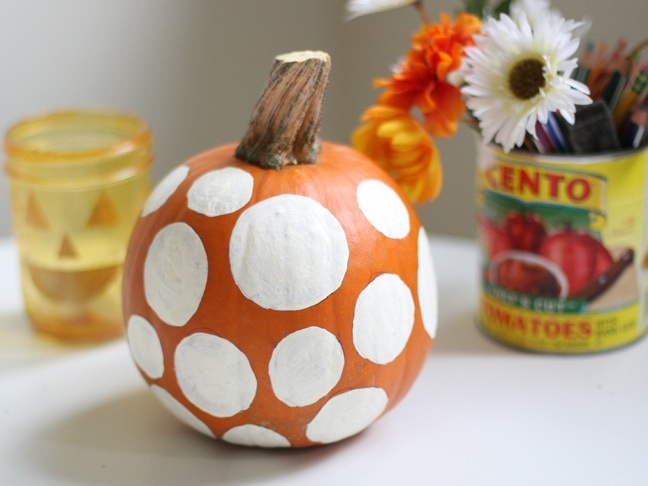 The polka Dot pumpkin made me giggle. 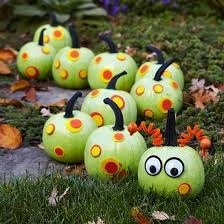 I really like all the green pumpkins. We will have green or white ones from now on! We even wanna try some fancy art work. So october can be a new hobby month. Our outside child will love it too! Thx Kathy for helping us make new memories! Yoooooooohooooooooooo! Did the halloweenies get you and take you away? Thinking of everyone who is struggling with this weekend….. Hold tight, and stay safe…. I only realized this year (age 62) how October has NO FEELINGS associated with it – when actually it should be associated with GORGEOUS weather, a perfect time to be outside enjoying the last flowers, the last harvest, the last of certain bird species, and on and on, not to mention getting the gardens ready for winter. Instead, I’ve been staying indoors and missing it all “forgetting” – until someone helped me realize this recently. Yeah! So yesterday, I spent an hour in the evening in the garden. Hope this helps others. Halowen make us sick.halowen make us throw up evin just to think abot it. I know the things ritual abuse survivors go through…I know several survivors myself. I am DDNOS (with alters) and have triggers at that time of year too (this is being written in March) but for different reasons. I have set some things into place for us with the help of a good friend. On Oct. 31 (she brings things before hand) we open a large bag filled with (mostly candy) stuff…the kids have to wait til it’s dark…that way they get to see something other then the night. We call my friend ‘The Candy Princess’ at that time of year…she also comes in Dec. and in the spring for the time that happens then. She has different names each time. We are co-conscious for the most part. So we have to get someone else to do these things or it’s just not fun! I have her do these things to help all of us (including me ‘the host’) learn that there is more then abuse and bad memories now…it takes a long time to do this…we have done this for many years and every year is hard but each year gets just a little better. A friend of mine “took back a day from the abusers.” She said YOU MEAN people do not deserve this day so we are taking it from you and making it ours. It’s hard to do this and yes I do agree at one time I would have said there is no way you could make this day even a little better but we have the Candy Princess or we have gone to people’s houses to stay safe in the past…and each year it gets just a bit better…not a lot maybe just the head of a push pin…but 20 or so of those make a bigger space then you would think. No it’s not a day or season we look forward to…and I don’t think we ever will. Because of the triggers we have and what we have heard from our friends has happened to them…it will never be good. I will never, ever make it a ‘celebration’ even if we have outside kids. But I can make it just a push pin better each year.